Grease a 9-inch square baking pan or iron skillet. Heat oven to 425°. Combine the cornmeal, flour, baking powder, soda, salt, and sugar in a large mixing bowl. In another bowl, whisk together the buttermilk* and eggs; stir in the cream-style corn and melted butter. Stir the wet ingredients into the dry ingredients just until blended. Spoon into the prepared baking pan or iron skillet. 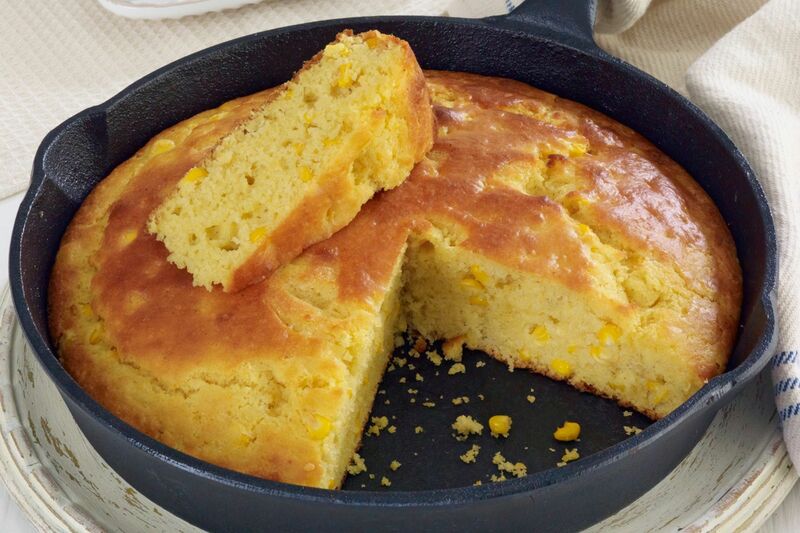 Bake for 20 to 25 minutes, or until golden brown and the cornbread springs back when lightly touched with a finger. *If you don't have buttermilk, measure 1 cup of milk into a measuring cup. Remove 1 tablespoon of the milk and replace it with 1 tablespoon of lemon juice or white vinegar. Let the mixture stand for about 10 minutes. Bacon Cheese Cornbread - Add about 1/4 cup of crumbled bacon to the cornbread batter along with 1 cup of coarsely grated cheddar cheese. Optionally, add 1/4 cup of sliced green onions. Jalapeno and Cheese Cornbread - Add 1 cup of coarsely shredded cheddar or pepper jack cheese and 4 to 6 tablespoons of finely chopped (seeded) jalapeno peppers.